We just lost a business anniversary book project because the potential client – let’s call them XYZ – chose a vendor who promised cost savings by printing in China. Please don’t be similarly naïve. Here’s why Chinese printing won’t work for XYZ and likely won’t work for you. Reason #1: You must allow at least 6 months for printing and shipping. If you’re already on a too-tight schedule, as XYZ is, you can’t devote half a year to production without seriously compromising the research, writing, and design phases. Reason #2: If your delivery is tied to a specific release date (conference weekend, gala dinner, etc. ), you may come up empty-handed. Chinese schedules are rigid. If you fall behind even by a day, many Chinese printers will move you to the back of the line. There goes another few months. Sorry! Or your shipment may be held up at customs, either by a random check or an arranged one. In either case you may be able to speed things up via a “payment” that erases your savings. Sorry! Reason #3: If your schedule coincides with certain Chinese holidays, you’ll further lose time. They don’t tell you this up front. But once again, sorry! Reason #5: You sacrifice quality control. In the USA your corporate history publisher can “go on-press” to oversee and fine-tune last-minute details. Your Chinese printer may promise to do that, but you won’t really know what’s happening until you open your first box of books. Maybe they’ll be perfect. Maybe they won’t. Reason #6: The printer you’re paying may not be the printer who does the job. Some English-language Chinese printer websites are run by brokers. They bid your job to bottom-feeders. Do you really want your project to be the vehicle in a race to the basement? Reason #7: Will the legally required notice “Printed in China” alienate your readers and damage your brand? The project we lost was for an American builder that prides itself on being fiercely patriotic. How will their customers and vendors react to Asian outsourcing? In today’s hair-trigger social media world, will a competitor use “Printed in China” to publicly shame XYZ? Reason #8: Your savings may be minimal. XYZ needs only 2,000 books. The difference between Chinese and US printing was only a few thousand dollars. That’s not chump change, of course. But if I were a betting gal, I’d bet that XYZ ends up saving pennies at most. Reason #9: Anything can happen. These observations aren’t just from CorporateHistory.net; they’re shared by a professor of publishing at a major East Coast university. He’s seen book creators being victimized by boiler room fires, mysterious and untraceable shipment losses, and similar catastrophes. Can “Printed in China” succeed? Don’t mainstream publishers do it all the time? Wasn’t printing practically invented in China? Yes, yes, yes. It can work if all three of these conditions apply: (a) you’re planning a good-sized print run and can allow an extremely long, open-ended lead time; (b) you’re a global business whose audiences will accept the China connection; and (c) you already print a lot of books in China, ideally have a rep in China, and have built up a relationship with vendors there (that’s what the big-name publishers do). Otherwise, caveat emptor. You know what that means in Latin. If I wrote it in Chinese, would you be able to read it? 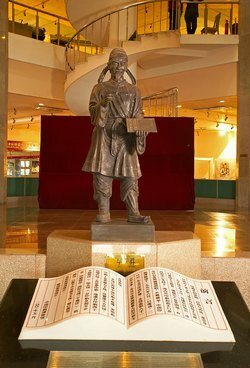 Display at the China Printing Museum in Beijing (photo courtesy of Wikimedia). Opting to print a corporate history book in China is often a mistake.